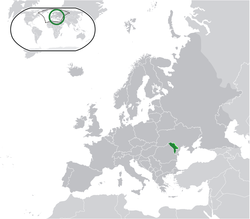 ↑ 1.0 1.1 "Chisinau Recognizes Romanian As Official Language". rferl.org. rferl.org. Associated Press. 5 December 2013. पहुँचतिथी 6 December 2013. ↑ Roudik, Peter (23 December 2013). "Moldova: Romanian Recognized as the Official Language". Law Library of Congress. पहुँचतिथी 13 जून 2014. ↑ "The text of the Declaration of Independence prevails over the text of the Constitution". Constitutional Court of Moldova. 5 December 2013. पहुँचतिथी 13 जून 2014. ↑ "Number of resident population in the Republic of Moldova as of 1st जनवरी 2014, in territorial aspect" (Press release). National Bureau of Statistics of Moldova. मार्च 17, 2014. ↑ "National Bureau of Statistics of Moldova" (Romanian में). पहुँचतिथी 2013-10-09. ↑ "2004 census in Transnistria" (Russian में). Languages-study.com. पहुँचतिथी 2013-10-09. ↑ 7.0 7.1 7.2 7.3 "World Economic Outlook Database, अप्रैल 2014". IMF. पहुँचतिथी 28 जून 2014.